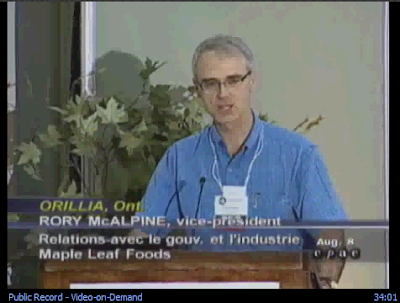 His name is Rory McAlpine and he's the VP of Government and Industry Relations for Maple Leaf Foods Inc. - the same Maple Leaf Foods whose contaminated equipment caused the worst listeria outbreak in Canadian history which tragically led to the deaths of 22 Canadians. If I were the President of Maple Leaf Foods Mr. McAlpine would be fired in the blink of an eye. Because on August 8th, at the 78th Annual Couchiching Conference during a session entitled, "Food Safety and Regulation: How Safe Is Safe Enough?" he decided to make light of Maple Leaf Foods Inc.'s role in the listeriosis outbreak. He starts his delivery at 33:50 in the video but I've cut the clip out and uploaded the "joke" to youtube and posted it below (email subscribers click the post title in the body of the email to bring you to the blog to watch). Amazingly Mr. McAlpine sets up his joke by stating that while others may have gotten in trouble for "making light of the tragedy", that he himself could talk about the "light side" of food safety because, "we were at the centre of it" and perhaps because his son also became ill from eating tainted Maple Leaf Foods bologna recovering within 24 hours. Unfortunately, this wasn't the first time I've heard this joke. The first time I heard it it was presented by someone from Health Canada who when I confronted her with its tastelessness initially defended her stand-up act by noting that the joke is really on the Toronto Maple Leafs. She was then duly mortified when I asked her if that would be any consolation for the 22 Canadians who died or their friends and families? It was because of her sincere regret after the fact that I didn't go public with that story. Here things are different. Here Mr. McAlpine is not a nervous junior Health Canada staffer; here Mr. McAlpine explicitly notes that he is indeed making light of tragedy; and here Mr. McAlpine is officially representing the admittedly culpable corporation at a conference on food safety no less. Mr. McAlpine, there's nothing funny about what happened, there is no "light side" to the circumstances and food safety issues that led to your company's killing of Canadians however inadvertently, and if you for one moment think I'm over-reacting you ask yourself if you'd have made that same joke if your son had died rather than simply gotten ill due to your company's failure to properly clean its equipment? The word that leaps to my mind to describe your actions Mr. McAlpine is repugnant - shame on you.